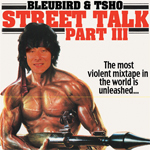 bleubird has just dropped his newest edition in the street talk series that began in 2008 with “street talk 2”. “ST2” was released through France’s Hip Hop Core and a few months later bleubird dropped “street talk 5” to kick off his brand new website. And NOW, “Street Talk III – The Mixtape” is available for free download. As well as offering this mixtape as a free download, bird has decided to actually create a “mixtape” in a physical form. A very limited run of cassettes will be available on his upcoming European tour and upon return he will make another 25 for all of us on this side of the Ocean! Personally I cannot wait to get my hands on a cassette. More cassettes should be made! Visit bleubird’s website and download his latest freebie. bleubird is on his way back to Europe for the first time since moving home to Florida from Berlin last fall. Most shows will be solo except a the shows in Germany near the end of the tour in which he will be performing as Prinzenallee with his nasty German beatmaker Jayrope. Prinzenallee are bleubird and Jayrope (read about them in the artist section). They have a finished album that will be coming out in the next few months through Endemik and in japan through our best friends at Granma Music. More info soon…. Check the dates and you will be listening to the new songs from Prinzenallee as well as some other special songs from bird. hi all. so as you can see this is our brand new site. been awhile in the making but it is finally in place and finished! well, their will be small touch ups here and there i am sure. that is it for now…i have spent many hours putting this together this week and i have nothing to say at the moment. look around and their will be more updates soon.